Castles and Cathedrals. Roast pig and flowing wine. Yes, Segovia has got plenty to keep you entertained for the day. 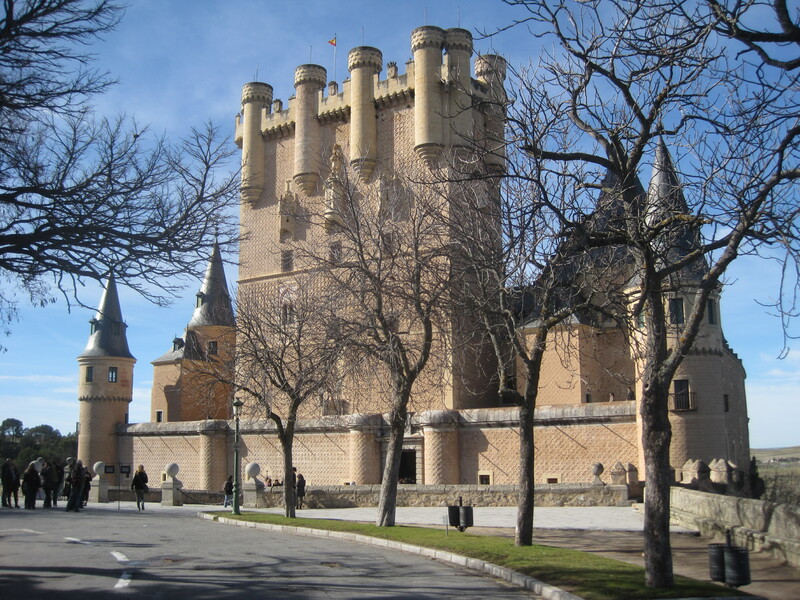 If you’re looking for an escape or day trip from Madrid you’ve got to check out Segovia, the city famous for inspiring the emblematic image of Walt Disney‘s castle. Set an hour to the northwest of Madrid, here you’ll find a historic city that has played an important role during periods of Roman, Arab, and Celtic occupation. The enduring Roman heritage is abundantly clear as you arrive at the central Plaza del Azoguejo. 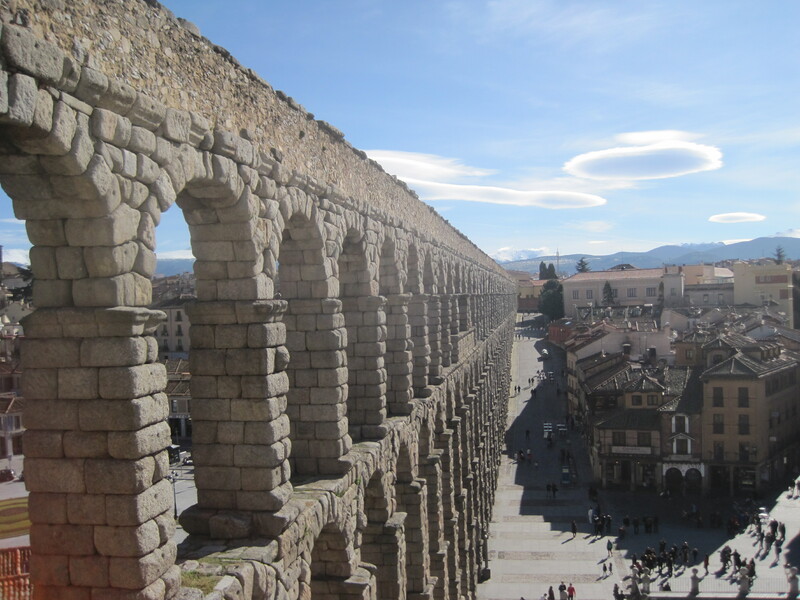 In full view you see the Aqueduct – a masterful exhibit of Roman civil engineering, it was used to transport water from a river located more than 11 miles away, and today the arching stone structure hovers above the main plaza, marking the starting point to explore the city. All the guidebooks give Segovia high marks – noting the impressive golden colored walls and stone buildings, the romantic winding roads, breathtaking views of snow-capped mountains, and of course the castles and cathedrals. And so, on a recent sunny Saturday, I was set on visiting Segovia and exploring the city for the day. After a couple quick calls I had organized my exploratory team: a group of 3 english teachers and 1 spaniard to serve as driver and guide. We took off by car at 10:45am and enjoyed the scenic route up into the hilltops, where green slops and white mounds of snow offered a pleasant change of scenery compared to Madrid’s bustling city streets. The drive took a little more than an hour, as we arrived at high noon, ready to take on Segovia. Standing at the main plaza – smack-dab underneath the Aqueduct – you can’t help but join everyone else and stand crane-necked, admiring the daunting structure and pondering questions like, who built this? And how? As you do, be sure to snap a few pictures then duck into the adjacent information office for a free map. We arrived without any planned activity or guide and in Segovia, that’s ok. The city is laid out almost in a loop so that you can walk along the main street connected to the plaza and pass each famous icon as you go. First up on your stroll is the Plaza Mayor where you’ll find upscale terrace restaurants and bars, a kid’s playground, and up ahead, the Cathedral. he carried on about a king we strode past to the Alcázar, his words echoing through the cramped cobblestone streets. Taking photos and admiring the castle, it was all royally impressive. The castle clearly has served as inspiration for Disney’s iconic castle image and almost makes the trip worth it by itself. How nice is this castle? Well it’s striking to the point you can spend 30 minutes gazing from every angle, imagining an epic battle or swanky royal party taking place. Hey, it’s so nice I bet if Taylor Swift saw it, she’d faint. Afterwards, wander and admire the old city walls and the steep drop down below. Also look back up at the segovian skyline – on a sunny day with whispy clouds – this view is tough to beat. Stuffed on pig and soaking in a fine, wine-induced stupor, we strolled the winding streets, stopping in tourist shops, pausing to stare at several churches and then admire the views out across Segovia. Back at the main plaza, we strolled up the steps and traced the Aqueduct up into the distance. The sights, the freshness of an unexplored city, the castles and cathedrals, and the lunch all made this quite a Saturday. Standing at the top of a vista point, almost leaning on the Aqueduct, we admired the sprawl of Segovia beneath us and the questions continued in our minds: who built this? Seriously how? And what must have this city been like, centuries ago? Then, “what time is it?” someone asked. The sun retired and a chilly dusk setting in, these were signs clear enough it was time to head back to Madrid. As we pulled away, Segovia behind us, one question was easy to answer. This was a day trip, well done. 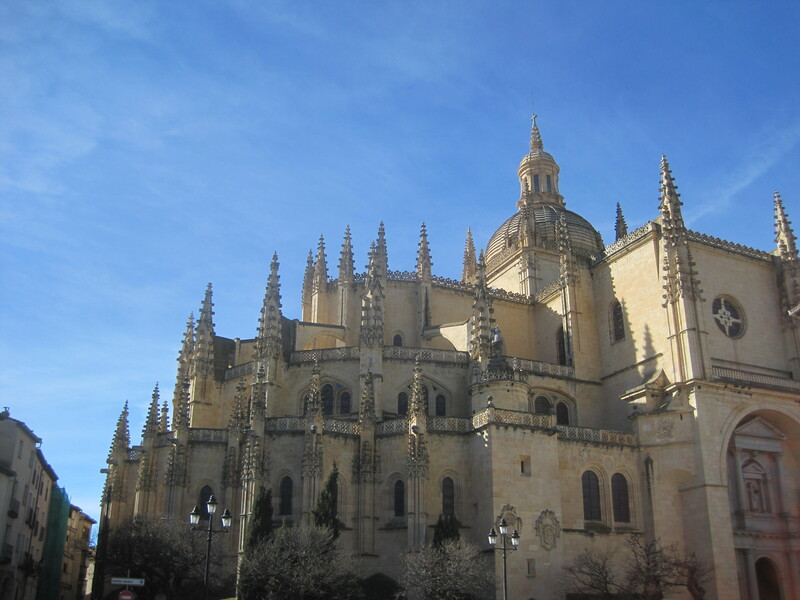 How to Get There: Coaches with entrances to the Convent, Museum of Teresa de Jesús, Plaza Mayor, Basilica of San Vicente, the Cathedral in Segovia and Alcázar. If You Visit: 1.) Visit the Alcázar 2.) Try the Roast Suckling Pig 3.) Visit La Granja if time permits. 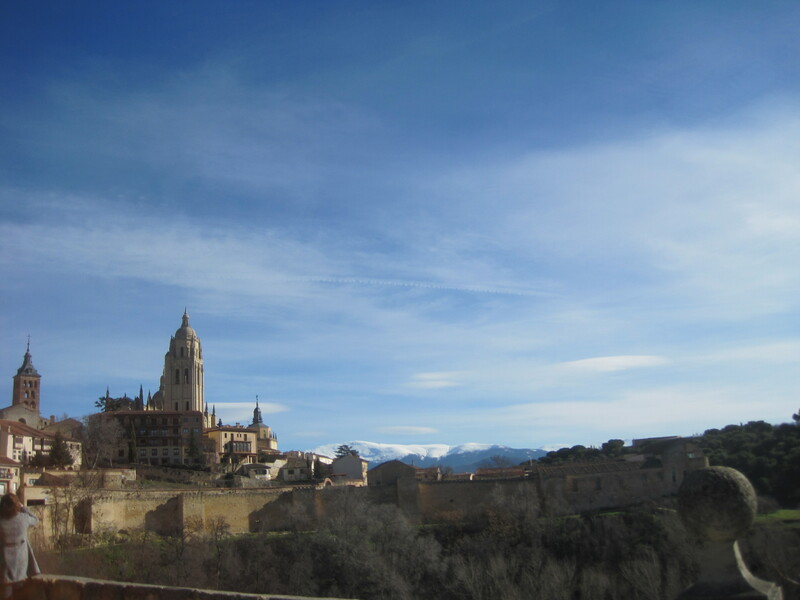 Did you like the article: Getaway: Segovia, Spain ?Comment and share!